Welcome to Rejuvenate, bringing you the latest news from The Bournemouth Development Company. In our Winter 2016 edition, we celebrate a national award win for The Citrus Building and review our public exhibition of plans for the former Winter Gardens site. Among other stories, we highlight progress with our proposed residential developments at Durley Road and St Stephen’s Road. To view and download Rejuvenate, click here. 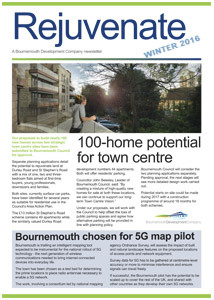 For more information please visit our website: www.bournemouthdevelopmentcompany.com or follow @BmouthDevCo on Twitter. Contact us by email: info@bournemouthdevelopmentcompany.com or phone 07825 382870.